Six-year-old Sophia with baby brother Caleb. A six-year-old girl has saved the life of her baby brother after becoming his bone marrow donor. Caleb Ashby needed an urgent bone marrow transplant after he was diagnosed to have a shortage of infection-fighting blood cells leaving him in danger of being killed by a common cold. His older sister Sophia was found to be a 100 per cent match, and bone marrow extracted from her hip after she bravely volunteered. Mum-of-four Kelsey Stynes, 28, who has two other sons, Zachary, one, and Tyler, eight, found out Caleb was going to be born with a heart defect when she was 22 weeks pregnant. He had truncus arteriosus, where only one large blood vessel leads from his heart instead of two, and a hole in his heart, when he was born in December last year. After spending five weeks in intensive care, Caleb was found to have bone marrow failure – where the soft centre of the bones fails to produce enough healthy blood cells to keep up with the body’s needs. Mother Kelsey with Sophia, 6, Tyler, 8, and baby Caleb. 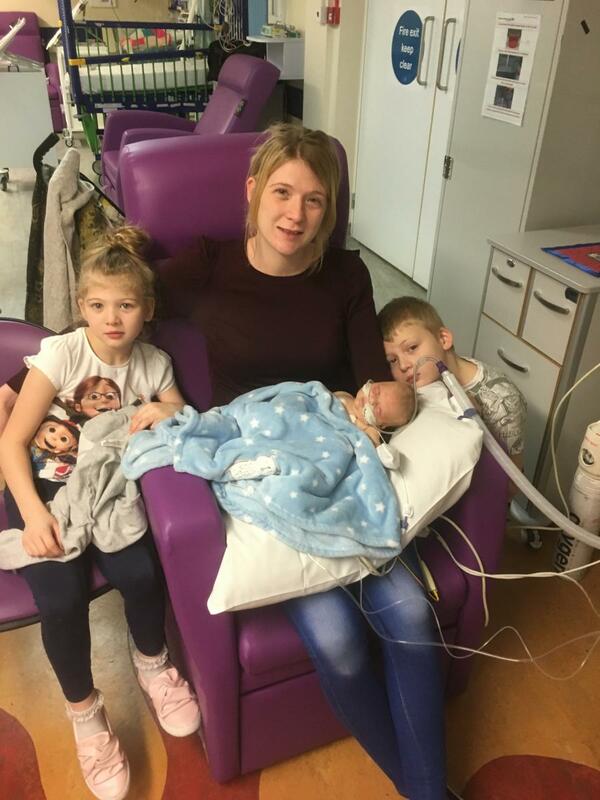 Kelsey and Dad Lee Ashby, 31, from Barwell, Leicestershire, had to wait for two weeks to find out if Caleb’s body had 100 per cent accepted his sister’s bone marrow. Four weeks on, the four-month-old is set to make a full recovery, but Sophia has refused to leave his side. She has fully-recovered from her operation but is attending the hospital school after been given special permission until her brother goes home in six weeks’ time. Kelsey said she had been "completely overwhelmed" by the experience. She added: "[Sophia] just amazes me. She has been fantastic for the whole way through this.